The search for Malaysia Airlines Flight 370, the longest civil aircraft disappearance in modern history, has unearthed more questions than answers, as the mystery surrounding the fate of the missing jetliner continues to intensify with each passing day. UK naval ship HMS Echo has arrived in the area where the missing Malaysian plane is being searched for. It will conduct underwater searches after preliminary environmental tests. The ship was dispatched after a Chinese vessel detected a pulse signal in the vast search area on two occasions. Whether or not they are being emitted from the flight recorders of MH370 is still to be confirmed. Chinese pilots involved in the search operations found white objects floating in the Indian Ocean, about 2,700 kilometers off the coast of Australia, Xinhua news agency reported. The pulse picked up by a Chinese ship searching the southern Indian Ocean for the missing Malaysian airliner does not belong to the black boxes Flight MH370, the China Maritime Safety Administration says. The signal picked up by the Chinese vessel's black box detector had a frequency of 37.5kHz per second, the official Xinhua news agency said - identical to the beacon signal emitted by flight recorders. Following a preliminary analysis, the agency now believes it is not connected to the jetliner. A black box detector on a Chinese patrol searching for missing Malaysia Airlines Flight MH370 has detected a pulse signal in the South Indian Ocean, state media reported. It has not yet been established whether the signal picked up by the Haixun 01 vessel is in fact linked to the missing jetliner, China's official Xinhua news agency reported. Sources in the Malaysian government later confirmed that the Chinese vessel had detected a signal though there is no confirmation on its origin. The announcement came as international crews search the Indian Ocean for the flight's lost black boxes before the devices stop emitting locator ‘pings’. Black boxes typically release a ping for 30 days. MH370 disappeared March 8, leaving rescue workers several days at most before its battery dies. A US Navy "black box" detector made has been deployed in the search for missing Malaysian Airline’s flight 370. The Australian naval vessel Ocean Shield arrived with a "towed pinger locator", which is capable of homing in on signals from the black box, AFP reports. However, Angus Houston, Australia's former military chief and now coordinator of the eight-nation search, said "we're now getting pretty close to the time when [the black box signal] might expire." Black boxes typically release a ping for 30 days. 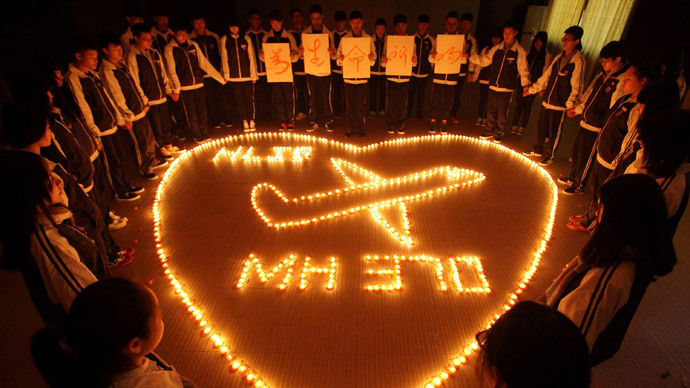 MH370 disappeared March 8, leaving rescue workers several days at most before its battery dies. Malaysian police say they have excluded the possibility that any of the passengers of the flight could have organized a hijacking, Xinhua news agency reported, citing Malaysian media. Malaysian investigators excluded three more possibilities, in which the main suspects were passengers of the plane. The police said they were referring to sabotage by passengers with psychological disorders or personal problems. "Suspicions according to four [possibilities] have been lifted from them (passengers)," said Khalid Abu Bakar, inspector general of Malaysia’s police, adding that the crew members, including both pilots, remain under suspicion in these four possibilities. The search area, which has repeatedly shifted as experts analyze radar and satellite data, is currently focused on a 98,000-square mile area off Perth, Australia. Lack of coordination between nations assisting with the search for missing flight MH370 has delayed the efforts, as the targeted area was 1,000 miles away from where the aircraft is believed to have crashed, sources familiar with the matter told The Wall Street Journal. The probe into the missing flight has been classified as a criminal investigation, Malaysia's police chief said, according to The Wall Street Journal. More people are scheduled to be interviewed. Meanwhile, the investigation into the pilot’s flight simulator remains inconclusive. Malaysian authorities now say the final words from the cockpit of missing Flight MH370 were, in fact, “Good night Malaysian three seven zero,” and not “All right, good night,” as was reported weeks ago. "We would like to confirm that the last conversation in the transcript between the air traffic controller and the cockpit is at 0119 (Malaysian Time) and is "Good night Malaysian three seven zero," the Malaysian Department of Civil Aviation said in a statement released late Monday.